This month, New Jersey Governor Phil Murphy announced the release of the state’s first GUNStat report, a report that details statistics related to gun violence, including the origin of the firearms used in the commission of crimes. The report aims to detail where those guns are coming from, in an effort to help raise public awareness and recognize trends. The report found that nearly 77% of the firearms used in crimes of gun violence in New Jersey came from other states, identifying the State of Pennsylvania as the top “source state” for crime guns. With its close proximity to Pennsylvania, Burlington County is a leading source of guns recovered in New Jersey. In fact, there were 17 guns recovered in Burlington County in April 2018. Among these, a total of five guns were recovered in Willingboro, NJ. Below is an explanation of some of New Jersey’s laws on guns for your reference. For additional information regarding gun laws or gun charges in the Burlington County area, contact the attorneys at our criminal defense law firm at 609-832-3202. While it is legal, under certain conditions, to purchase a firearm out of state and bring that firearm into New Jersey, many restrictions apply and you must obtain the proper permits and follow required procedures. 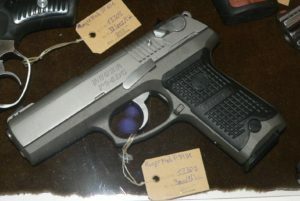 In order to obtain a handgun in New Jersey, you must first apply for a New Jersey Permit to Purchase a Handgun. A separate permit is needed for the purchase of each handgun and New Jersey law imposes a limit of purchasing only one handgun per month. If you want to buy a shotgun or a rifle you must complete and submit an application for a New Jersey Firearms Purchaser Identification Card. Certain types of firearms are banned in New Jersey, including assault rifles. If you are transporting a firearm into New Jersey or through New Jersey, the firearm must be unloaded and contained in a case or carrier or locked in the trunk of the vehicle. The firearm cannot be directly accessible from the passenger compartment. If you are transporting the firearm into—instead of through—New Jersey, you must obtain any and all relevant permits including a firearms purchaser identification card, a carry permit (if you are seeking to carry the firearm) and fulfill all registration requirements under New Jersey law. The purpose of gun control is to prevent gun violence. Gun violence and gun related offenses are treated very seriously in New Jersey. In addition to criminal offenses for possession of a firearm that you do not own or do not have a permit for, having a gun during the commission of another crime can significantly heighten the degree of the offense, as a gun is considered a deadly weapon. For instance, robbery is a second degree crime that becomes a first degree crime when a gun is involved. Similarly, burglary is upgraded from a third degree crime to a second degree crime if the defendant is armed with a firearm. Even if you are not otherwise engaged in criminal activity, a typically law-abiding citizen could be charged with a gun offense if they are not educated about the requirements under New Jersey law. However, ignorance of the law—that is, not knowing what the law is—is not a valid defense. If you have been charged with a criminal offense involving a firearm in Burlington County or elsewhere in New Jersey, you may be facing significant jail time, fines, and a criminal record. With such strict laws, if you are a gun owner or a prospective gun owner, it can be difficult to have confidence in your compliance with New Jersey gun laws. The experienced gun lawyers at our firm are experienced and knowledgeable about the nuances of New Jersey gun laws. We are prepared to help you navigate through the process of registration and permitting for a firearm or represent you against criminal allegations, if you have been charged with a gun related offense. Contact us today at 609-832-3202 for a free consultation.